It may be hard for me to fully explain how much I disliked this book, but I’m going to give it a try. It begins with the opening pages when we meet the improbably named hero, Court Gentry, otherwise known as The Gray Man. That is about all we learn about this character and it’s passed along in about as many words. Obviously developing a three dimensional character is not something Greaney is interested in, but the Gray Man doesn’t even make it to one dimensional. It’s a bad sign when you find yourself hoping to spend more time with the villians than the hero. The plot, Gentry is tracked across Europe by a number of different international kill teams, is basically a setup for a number of different action set pieces. I love a good piece of action writing as much as the next person, but after the fifth fight sequence they take on a boring regularity – fight – move to new location – fight – move to new location – etc…. The reviews for this book talk about it being like an action movie, but you’re better off renting Die Hard than spending time reading this one. With so many other great spy/assassin thrillers out there it’s hard to imagine why someone should read this one. Last Words: There is a sequel. I will not be reviewing it. Really good and funny review. I’m sure I enjoyed the review far more than reading this book. I stumbled along your review of “The Gray Man” and could not disagree more with you, esp having read the sequel, which I thought was even better than the first of the Gray Man series. If your idea of action is based on the Die Hard movies, then maybe you should be reviewing books of the Sweetvalley High genre and leave the true action/thrillers to the adults who enjoy fast paced action thrillers. 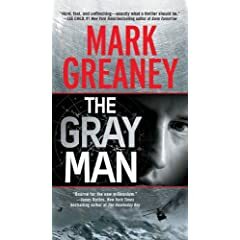 I am a fan of thrillers and I put Greaney right up there with Harlan Coben, who is one of the best in my opinion- which everyone is of course entitled to their own. You are certainly allowed your opinion, and there seem to be enough people who disagree with me to warrant a sequel. However I found the book to be truly thin on any character development at all. Maybe he was saving that for the sequel. If you enjoy action/spy novels, I would check out Alex Berenson, David Stone or Vince Flynn. I think they all do that type of action writing much better. Of the three authors you said to check out, I have to agree with Vince Flynn being a master story teller. Greaney’s books are a bit more technical and really concentrate on tactics where Flynn leaves a bit to the imagination. We’ll see more about Court in the future, I’m sure. Every person that I know is a Vince Flynn fan has loved these first two books. I have heard comments like, “He nailed it on the first book, where many authors it takes two or three”. “Clancy and Flynn in one”, from a well experienced and educated operator. jquest922, do you have any experience in this world that Mark writes of? Ha! That would be an interesting change of pace. My experience is purely through reading fiction and non fiction on the subject. I think where I have a problem is that getting technically correct stopping power of pistol (or whatever it might be) doesn’t matter if I don’t care about the characters. The author of this book never gave me a reason to like or care about his lead protagonist. When I’m reading a novel that a major problem. We’ll agree to disagree! A le Carré sneak peek?